Simply sandwich the table between the holding brackets and allow the transport system to do the work. You may rotate the table top 90 degrees (vertically) to fit thru tight spaces. The entire system is coated in safety yellow for high visibility. 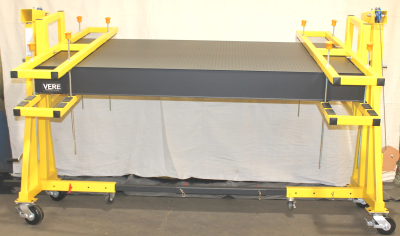 Installs around a table mounted on 4 legs so no other lifting equipment is needed to support while removing legs. Fits up to a 6’ wide x 16’ long table with a maximum thickness of 24”. System includes a manual crank to lift the bread board. Disassembles for easy storage and transport.